A compelling new art show exploring female presence and identity is being held at Candela Gallery and Books on 214 West Broad Street. The gallery is only a ten minute walk from campus, and well worth the leg stretch. The name of this show is A Dot Red with featured artist Christina Blackwood. She uses modern and contemporary photo and text techniques to explore the ideas of identity and history in her work. This exhibit displays these ideas as she explores the female presence in history and society through the use of strategically placed red dots and in two series, The Boys of Collodion and Naked Lady, and her piece “Girl”. The aspect of female presence in the pieces for this exhibit are shown through the use of the red dot. 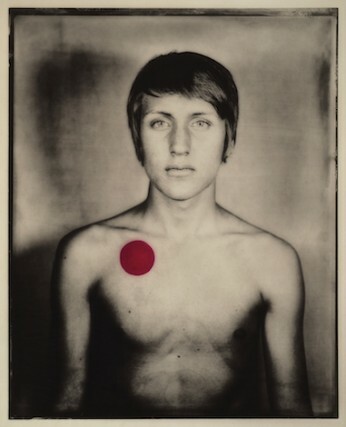 In Blackwood’s work, the red dot represents female presence. The brightness of the red against the monotone background of the art commands the viewer to pay attention to it. The contrast is as symbolic as it is artistically pleasing. 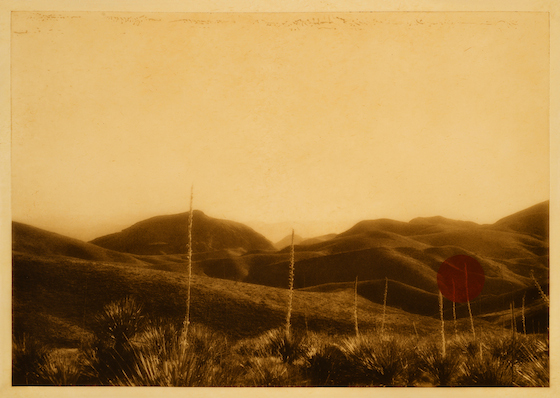 We first see this in Naked Lady, where Blackwood places red dots on photos of desert landscapes taken by male photographers. By placing a red circle on top of the figure’s chest she seems to try to carve a female’s part through what she perceives to be male-dominated and documented history. With The Boys of Collodion the relationship of male and female is explored through the roles of artist and subject. Historically men have often captured women in their “idealized” forms; through this series, she attempts to reverse the parts of the male and female. The otherwise average portraits have a red dot overlaid on the upper left chest of every male. This could represent the men becoming more feminine. Interestingly enough, the piece “Collin” only has one red circle on his chest when shown online, but when seen in person, there are now two. The artist added a second circle after it sold almost immediately. As a red circle placed on a piece of art in galleries often stand for the piece being sold, this second dot gives a deeper level of meaning from female presence, to the consumerism involved in the art business. By simply identifying someone by their gender, do we take away their identity? It gives us the impression that they are no longer a person, with views and goals and a personality, but rather just a gender. Even the pink color of the piece gives a more passive tone, than the powerful red dots seen in all of the other art. A second recurring theme is the number nine throughout her works. The repetition of the number nine could easily intentional or coincidental. The piece “Girl” is made of nine prints to make the full image. There are nine landscapes pictures, and while only eight of the portraits are displayed, nine boys were sent to the gallery. Nine can symbolize gestation, or the period of pregnancy between conception and birth. This relates more closely to the series The Boys of Collodion where Blackwood creates young men in her idealized view, as if to give them life. This could also be her turning them into the female presence by giving them the historically passive role of most female subjects in art. More realistically, female presence relates to these male figures in that they were birthed by a woman, and most likely raised by one as well. Even without holding any feminine qualities or aspects themselves, women play a key role in their existence and lives. This show succeeds at exploring the idea of gender through a use of photography and wet collodion tintype process. The unique photo process is enough of a reason to come see the show itself; it is a unique technique that is executed perfectly. A Dot Red also gives a new and innovative way to look at an old subject. The red dot in its simplicity provides a unique lens to look at the relationships between genders by manipulating the viewer’s perspective on the subject. Through the desert plains in Naked Lady to the faceless portrait of “Girl”, this show will allow you to look through the lens of the red dot to see the artist’s interpretation of women’s place in society. For more information, visit Candela Books’ website.